With the warmer weather and some south winds many birds have made their way back north into Indiana over the past couple of days. Last weekend many species of waterfowl migrated back into the state. The migration of waterfowl continued this weekend but some passerines were also on the move. This weekend I birded many areas on the northern shores of Lake Monroe. The amount of singing birds was also a nice sign of spring. I have been hearing many Northern Cardinals, Tufted Titmice, and Song Sparrows. Today I also heard the boucing ball trill of the Field Sparrow for the first time this spring. American Robins-There was a large flock of robins at one spot on Lake Monroe. 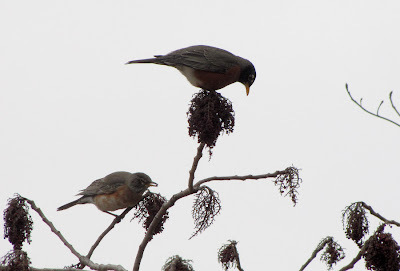 The robin on the left was unusually pale. 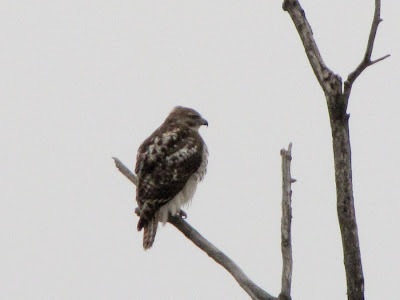 This young Red-tailed Hawk kept cruising over the feeding robins. Each time the robins would give their plaintive, high pitched call to warn the flock that he was back. My first warbler of the year-A Yellow-rumped. 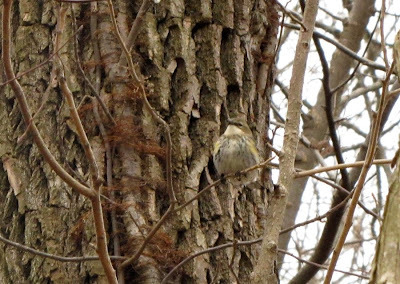 This Yellow-rumped was feeding with the robin flock. 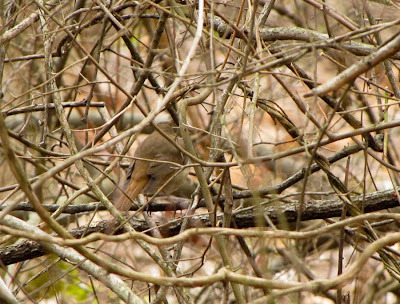 I posted a photo of a Hermit Thrush recently that didn't have this many branches in the way-this is the usual view of a Hermit Thrush.